It was a beautiful, breezy day, so I had to get out for some Kite Aerial Photography (KAP). 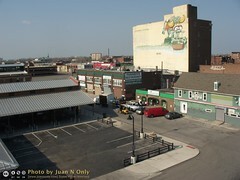 I went to Eastern Market (which is the location of Detroit's Farmer's Market on Saturdays). I struggled against turbulent ground wind to get my Flowform kite airborne. A passerby--Johnny--took an interest in what I was doing and came over to talk to me (and ask for money to get something to eat). He offered to help me launch the kite. After several attempts, I was about ready to give up on the location. However, Johnny was eager to see the kite aloft, so I tried one more time and was finally able to coax it up above the ground turbulence. The wind was quite gusty, even up high, so I waited a while to see if it would be stable enough for the camera. Up to this point, I hadn't said anything to Johnny about a camera. When I was feeling confident enough with the kite, I said, "Now comes the fun part." "What's the fun part?" asked Johnny. "Putting a camera up there," I replied. "How ya gonna do that?" So I proceeded to show him. With Johnny's help, I got my KAP rig on the kite line, the camera in the rig and then the whole thing aloft. All was going well, but then I had some scary moments when gusts of wind played havoc with the kite, so I brought it back in after a few minutes of aerial photography. Johnny was flabergasted by the whole experience. I can't even count how many times he said, "You have made my day!" Thank you, Johnny, for your help and I'm glad I was able to brighten your day. My sweetheart gave me a surprise birthday present of a trip to Mexico. I found out on the evening of Thursday, March 24th. The next morning, we were on a direct flight to Cancun, Mexico. 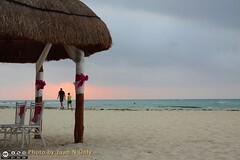 We stayed at a resort just North of Playa Del Carmen, about 70km/43 miles South of Cancun on the Caribbean Sea. Saturday morning, we went into the town of Playa Del Carmen and wandered around the shopping district. We found this nice little shop that sells locally-made clothing, mostly cotton, linen, etc. I bought a cool shirt and my honey bought a nice summer dress. We knew we wanted to visit some Mayan ruins, however, if we were to go to Chichen Itza (which is one of the most popular sites for Mayan ruins and which my partner kept referring to as "It's a Chicken"), it would have taken a whole day. 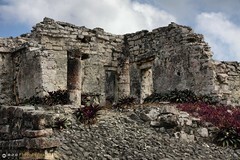 We only had three days there, so on Saturday afternoon, we went to the ruins at Tulum, which is about 60km South of Playa Del Carmen. It was very interesting and provided great photo ops. 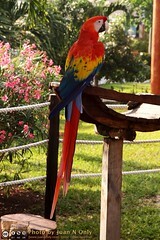 On Sunday afternoon, we were sitting on the balcony of our hotel room, when we heard a rustling in the trees. 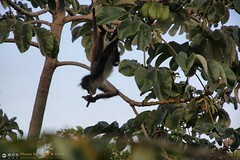 We then saw a monkey climbing and swinging amongst the branches. He grabbed some fruit from the tree and had himself a little meal. I grabbed my camera and began snapping shots. He disappeared into the branches and then another, larger monkey appeared and he also ate some fruit from the trees. The little one came back before they both swung away and left us delighted to have seen them. Photographic lesson learned from this experience: Don't rely on auto-focus. The auto-focus usually focused on the branches and leaves that were closer to us rather than on the monkeys. 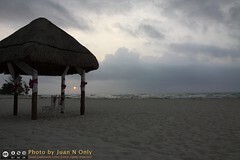 We got up very early Monday morning--before having to get ready to leave Mexico for home--in order to go down to the beach to catch the sunrise over the Caribbean Sea. Cloud cover on the horizon, however, made it rather disappointing. I tried to make the photographic most of what I had with which to work. That afternoon/evening, we returned home to Michigan and 30-some degree temperatures--a rather unpleasant reality check after having days in the 80s and nights in the 70s. Click here to view my set of photos from our trip at Flickr.com. My new Sony NEX-5 camera was damaged rattling around in my KAP bag (the LCD screen cracked), so it was back to the Canon A630 for this Kite Aerial Photography (KAP) outing. I used the GentLED 'Peanut' for my NEX-5 to rotate the pan axis of the KAP rig and ran an intervalometer script on the A630 to fire the the shutter at intervals. Both of the lithium-ion batteries that I usually use to power the RC receiver and the servos on the rig are currently not taking a charge, so I had to set the tilt angle of the rig to a fixed position, making this an auto-KAP session. For this set of photos, I went to a field next to the Wayne State University Matthei Atheletic Complex. 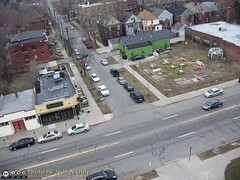 I did KAP from this area last summer, however, this time I had a couple of specific targets in mind: The Woodbridge Pub (which has hosted Exposure Detroit exhibits recently) and the park across the street from it. While the KAP rig was on the kite line, I had some lulls in the wind that required reeling in line until the wind picked up again. In the end, I got two rotational passes at my targets before a sustained lull made me decide to call it quits for the day. Turned out to be good timing, because it started raining just as I got back to my vehicle with my equipment. The results were rather disappointing. Most of the shots were blurry to some extent (the one shot that perfectly framed the Woodbridge Pub was very blurry). It was an overcast day, so I set the camera to aperture-priority with the aperture wide open (f/2.8). However, I should have manually set the ISO speed to a high value but didn't think of it. Another problem is that the GentLED turning the rig isn't synched with the intervalometer firing the shutter, so some shots could have been blurred if they happened at the same time.